Our Daventry office is located in the pretty market square in the centre of the town. There is free parking available right outside our office on the market square itself. The office opened in 2006 and the team specialise in property within Daventry and the surrounding villages between Rugby and Northampton. 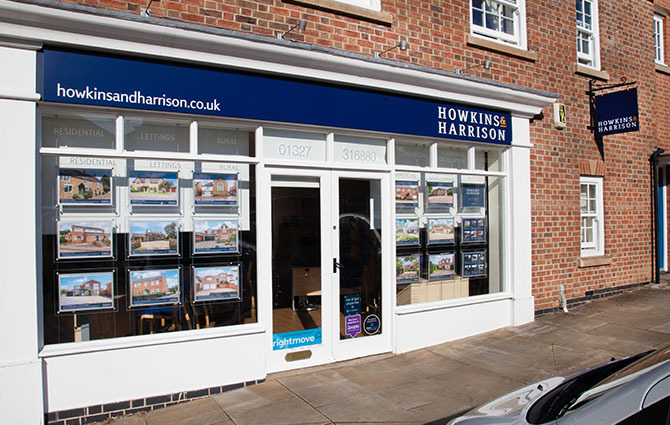 Our in-house teams here work mainly with property to sell, buy or let but we can also help introduce you to colleagues at our Rugby office, who work with commercial property, farm & rural, auctions, and planning & development. Daventry is a diverse district with beautiful countryside and all the benefits of being close to the national road network. It provides a sought-after balance of urban and rural lifestyles, covering an area of 250 square miles. At its centre is the historic market town of Daventry itself. Within Northamptonshire, it is a thriving and growing district. With beautiful villages, woodland, canals, reservoirs, country parks and a wealth of country houses, there is a lot to discover. Some places of note are Althorp House, Canons Ashby, Cottesbrooke Hall and Kelmarsh Hall. There are plenty of sailing and fishing opportunities at Pitsford, Hollowell and Drayton reservoirs. And the award winning, Daventry Country Park offers picnic spots, walks, cycle tracks and lots of wildlife. The district also has a lot of sporting facilities with Daventry Leisure Centre, golf courses, football and rugby clubs, as well as a skate park. There is also karting available at Whilton Mill. The district is very proud of its heritage and is steeped in history wherever you look. The Battle of Naseby, the plotting of the Gun Powder Plot at Ashby St Ledgers and the site of one of the largest Bronze Age hill forts are all in our area. Daventry also became the home of the BBC’s World Service transmitters in the 1920’s, using the call sign ‘Daventry Calling the World’.